Today sees the release of a pair of Dancing Butter Spacers ($92 USD/$120 CAN), Dancing Butterfly Studs ($57 USD/$74 CAN) and Dancing Butterfly Earrings ($45 USD/$59 CAN). 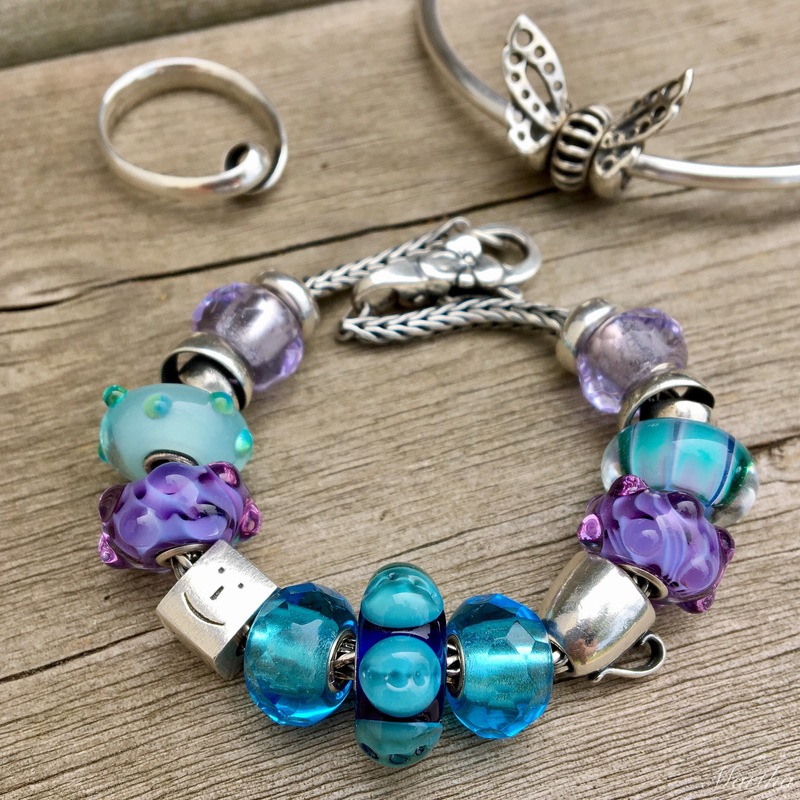 They are designed by Louise Rimpler and play off the theme of her Dancing Butterfly bead, which you can see below on the top of the Fantasy Necklace. 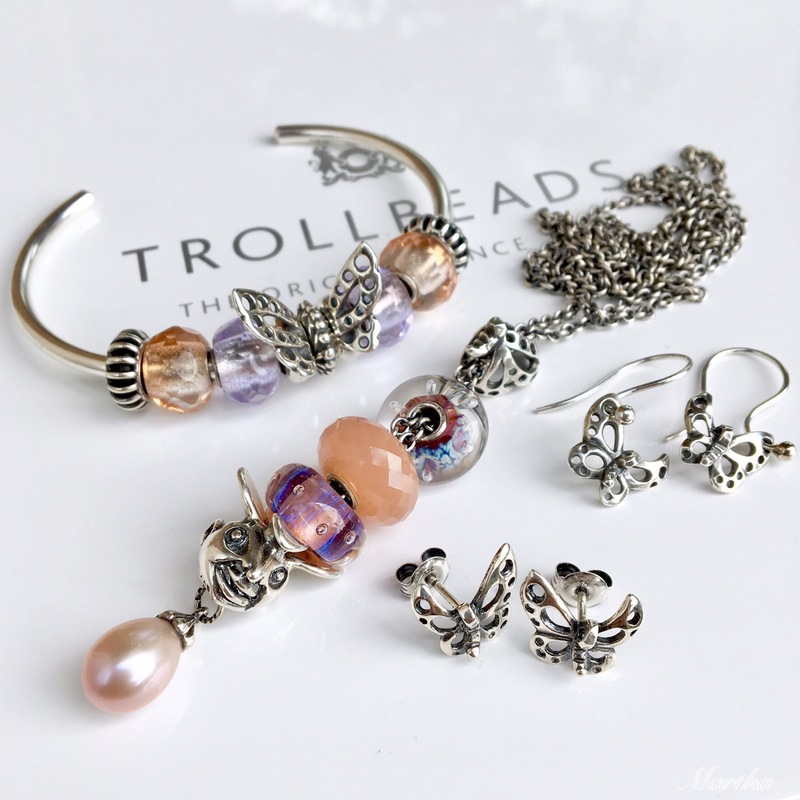 Trollbeads has been showing the Dancing Butterfly Spacers with the Summer Trees bead. I tried it with some glass beads such as Traces. Those are two Azure Bubbles and Ancient Palace below. One thing to note is that @garnet9257 of Instagram mentioned that the spacers are not actually identical! I looked really closely and saw what she is talking about! Can you see it in the above photo? The wing on the right has a slight curve in it so it gives a feeling of movement. Wonderful! I thought it looked sweet with Pink Desert and some copper. 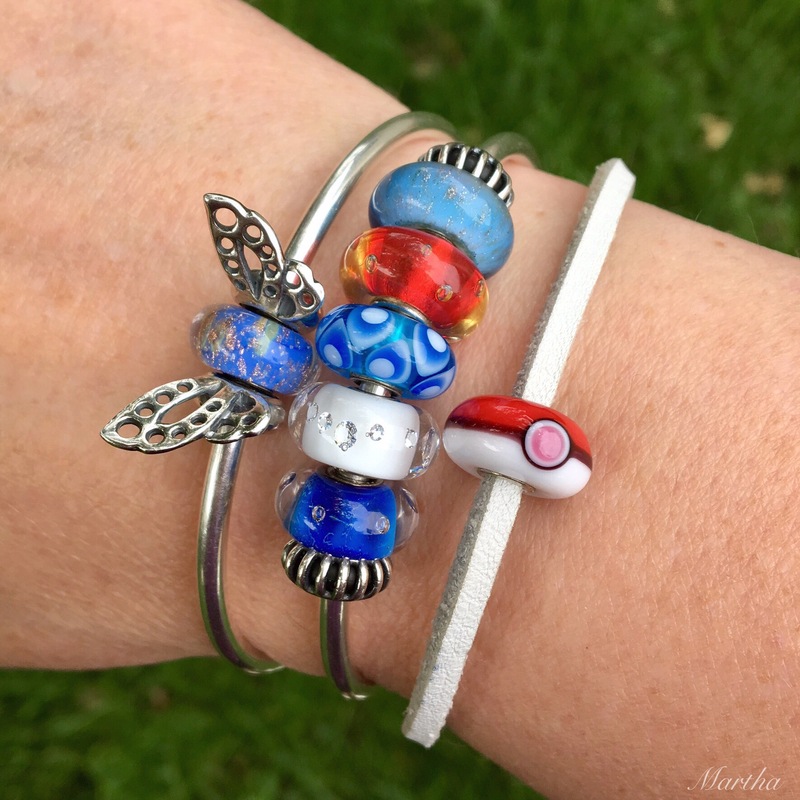 At the suggestion of @charmbead I made up a Nintendo combo, using the blue Fountain of Life bead from the Sparkle Kit in order to represent a Navi from Legend of Zelda. On the middle bangle from top to bottom are Beach, two Uniques, The Diamond Bead/White and The Eye. This would be a good 4th of July combo, although I’m Canadian so need to come up with a red and white combo for July 1st, our 150th birthday! 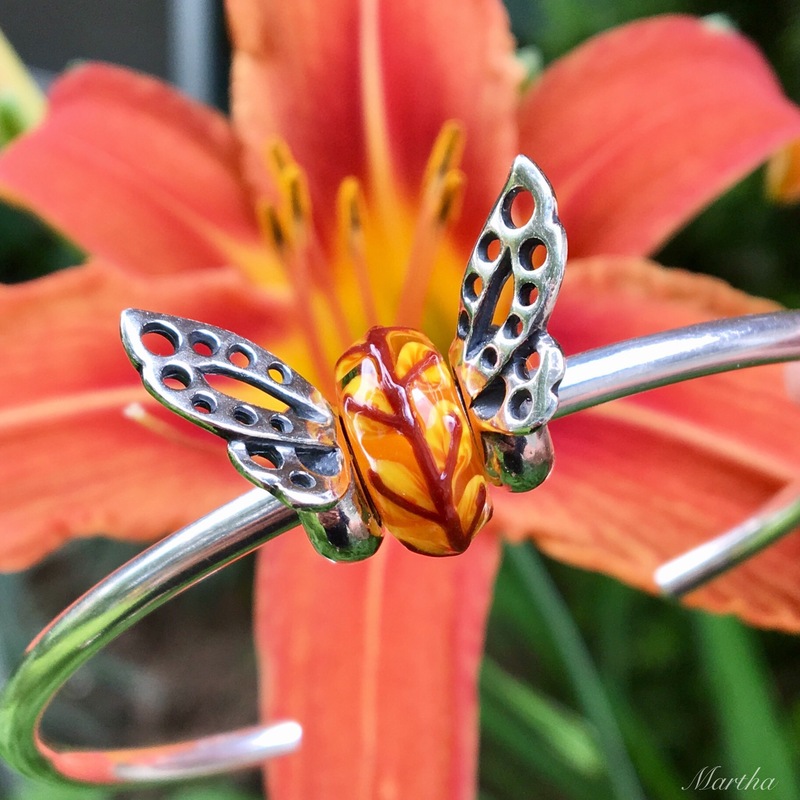 I thought this bangle reminded me of the Greek Goddess Nike. Another way to wear the spacers is with a narrow silver bead in the middle. 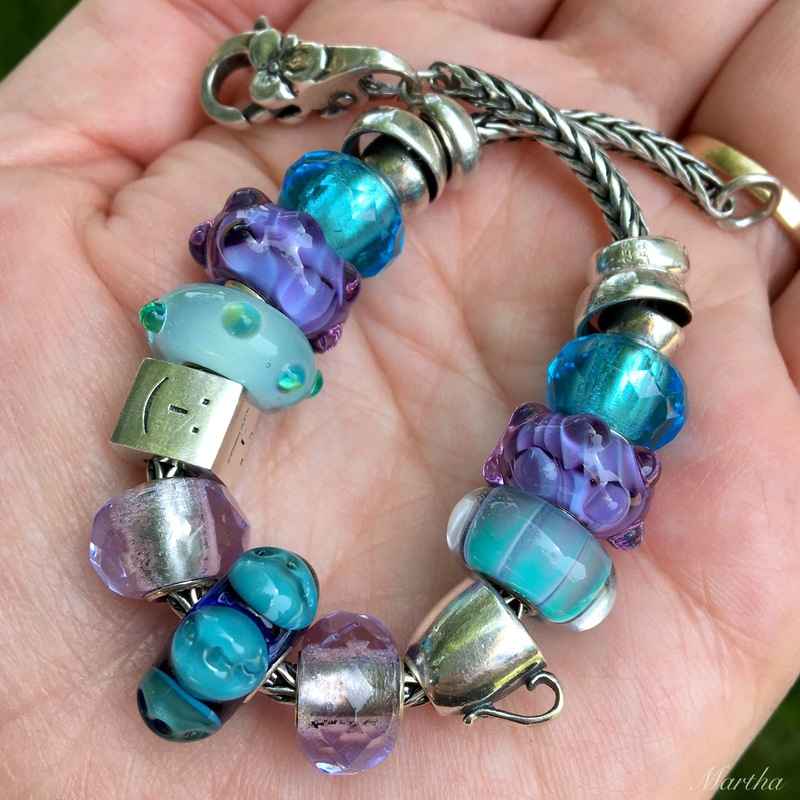 Here I’ve used the Vision of Light bead from the Spirit of Life collection (and I’m getting excited about this fall’s collection, but I don’t know what’s in it!). I’ve also used the Lavender and Pink Prisms, which I’ve been a bit obsessed with lately. I think this is my favourite look of all these different combos as it looks so clean and elegant. I also really like the Sunbeam Spacer in the middle. That’s the Neverending ring, which is insanely comfortable and a bracelet using the Light Turquoise Prisms and Dream Away in the middle. I also tried rearranging the beads so that the Lavender Prisms would be beside the Dream Away. Not sure which one I prefer! For an asymmetrical look they look cute in the side of a bangle. 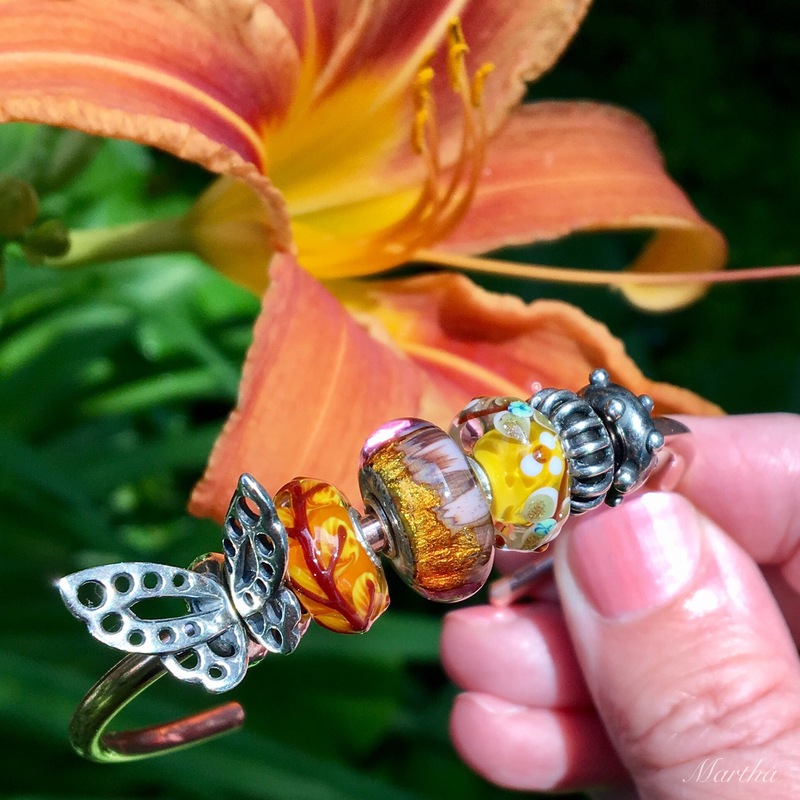 Left to right the glass beads are Summer Trees, Golden Cave and Summer Flowers. 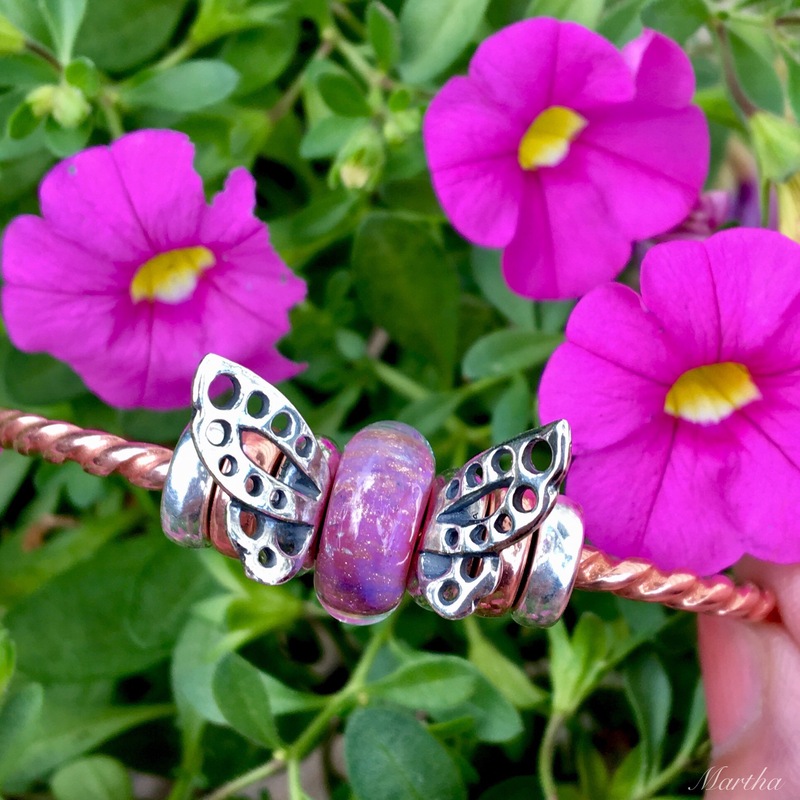 Lastly, here are the Dancing Butterfly Spacers on a chain bracelet. It works fine but I prefer the look on a bangle. By the way, I wore these for a few days and even with folding lots of things inside out while doing laundry, they weren’t catching on things. 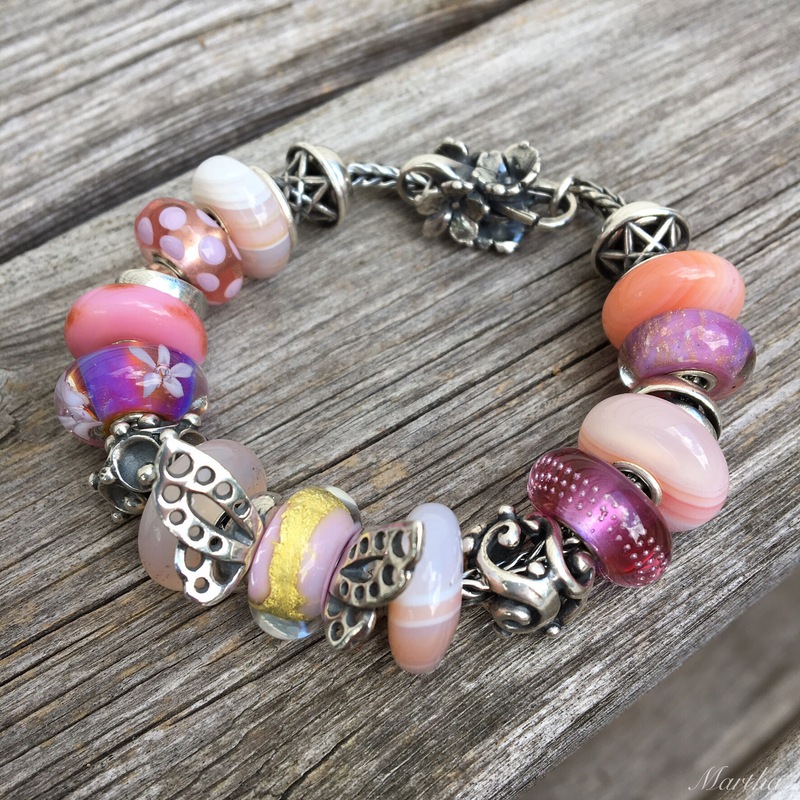 This bracelet uses the whole Pink Striped Agate Kit. 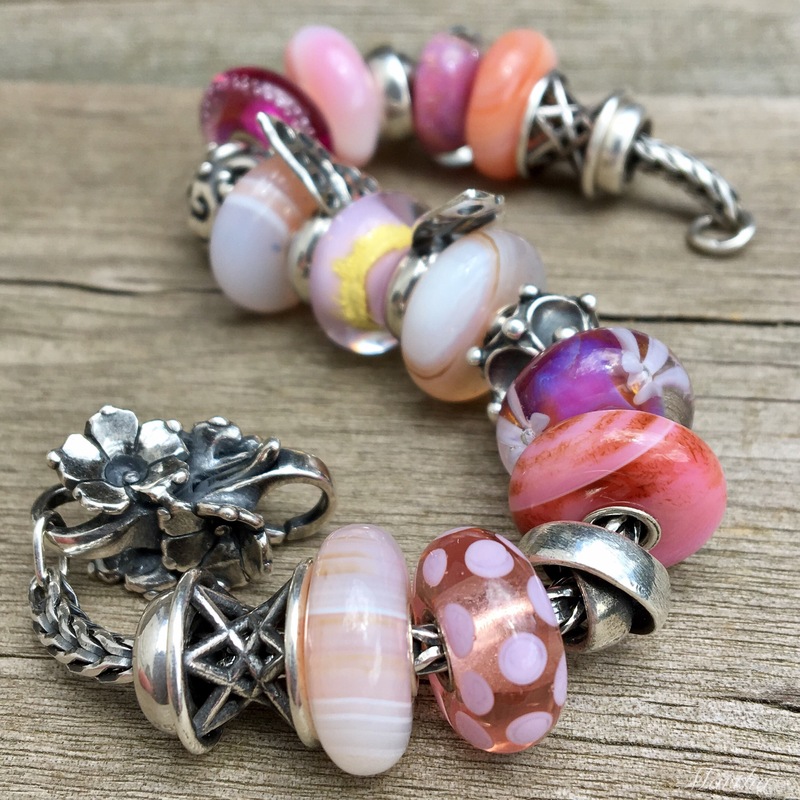 The other beads starting at the top and going clockwise are Smile of Stars, Pink Desert, Neverending, Silver Trace/Pink, Moonlight Dancing, Pink Gold, Water Lily Family, Sea Anemone, Neverending, Summer Dot and Smile of Stars. The lock is Carolina Jessamine. It’s so substantial! Obviously there are piles of ways to use these spacers. I’d love to hear if you plan to buy them and if so, how will you be using them? Disclosure: For this blog I may receive some items as promotional samples. Beautiful combinations, Martha! I prefer the thinner beads as the body for a more elegant looking butterfly and the rounder beads for a more cute look. As Kyungjin noticed, the butterfly wings are slightly asymmetrical and it gives a moment of movement to the design. That subtle detail is very clever and I’ve been enjoying everyone’s photos on Instagram. Hi April! It was fun this morning to wake up and see lots of butterflies on Instagram. 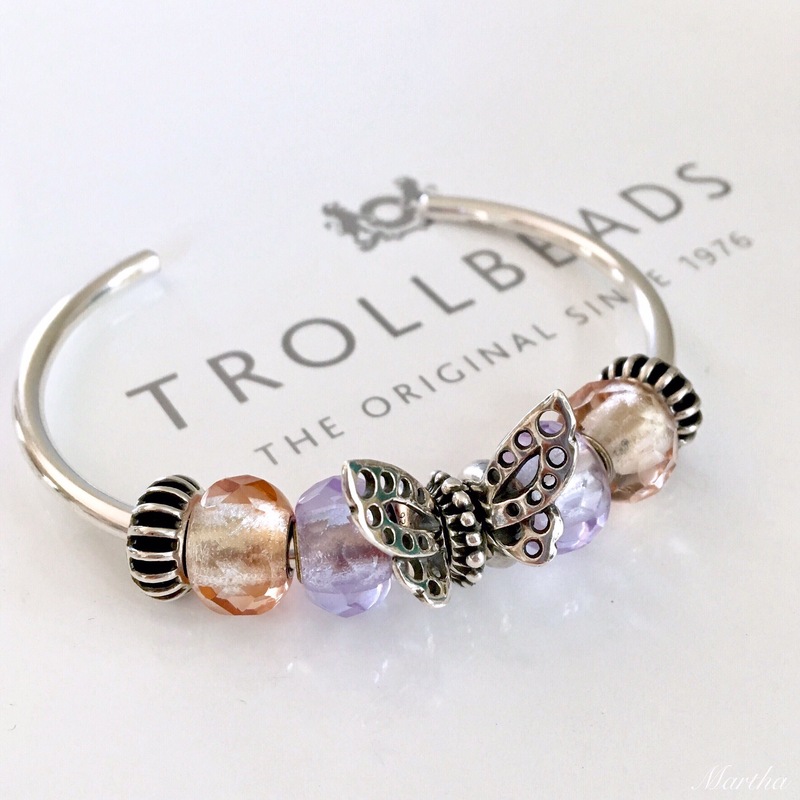 I hope Trollbeads continues to make decorative spacers like this that are also a bit of a statement piece. I love how they can look elegant or cute, as you say. I also prefer them on a bangle! They really make the bead in between pop. and pink desert bead on copper bangle.. it looks so cute! I should try this next time. Hi Kyungjin! Just one bead and the spacers on a bangle is all that’s needed, I think! I loved your photo with the gold in the middle-fabulous! Hi Martha, I love everything you’ve done, but the bangle with the Pink and the Lavender prisms is my absolute favorite. I’m not one to do asymmetrical bracelets… well I wasn’t…but I’m really liking how it looks! Hi Suzanne! That’s my favourite too. I recently bought two Light Turquoise Prisms, oh, they are in the photos, so I want to try them with the Lavender Prisms and the butterflies. I also rarely do asymmetrical things but love, love, love the look of the butterfly off to the side! Hi Martha. Just as little side note. Since we were speaking of prisms here, I wanted to let you know I finally ordered one today!…a retired Red Pink one. There’s also a Turquoise one that looks like it has some purple in it that I have on my wish list. And of course I want a Lavender one….etc. etc.etc. Oh that sounds lovely, Suzanne! I have three colours of prisms now and of course I’d like more, too! 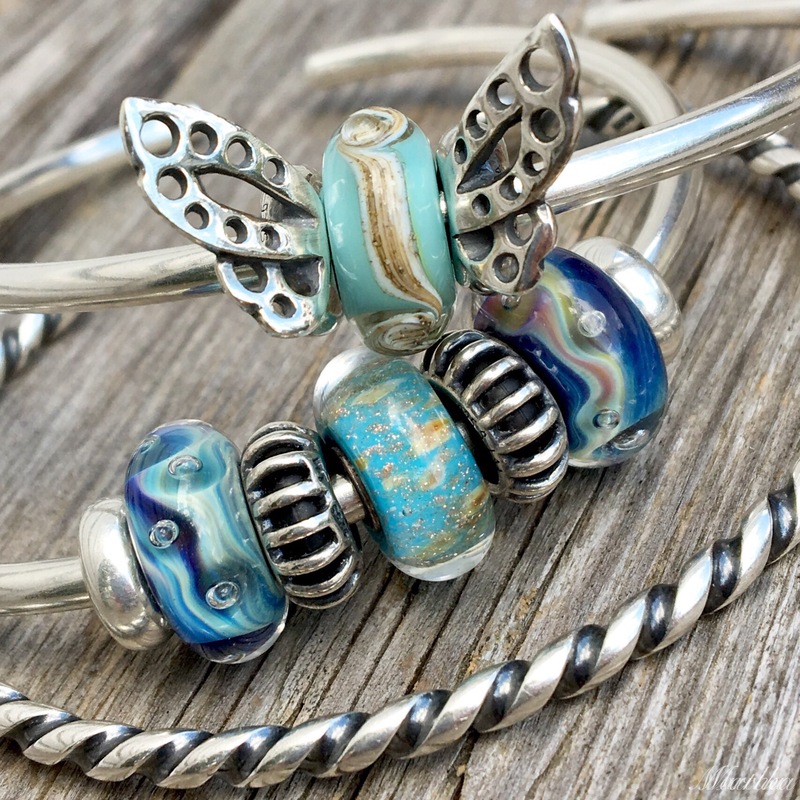 Next week I’m going to a Trollbeads store in Michigan with my girlfriends but I think I’ll look for a couple of glass beads that I’ve been eyeing. I would also like to tell Kyungjin that I LOVE her bangle with the bougainvillea. Stunning! I’ll let her know on IG in case she doesn’t see this! I really love them but I’ll probably wait for some sort of promotion or offer to buy them. So not right now as I’ve already spent all my bead money for this summer anyway. I love your asymmetrical one icluding the colors and no bead in between the spacers! The scale of these spacers seems perfect for bracelets. I did not indulge in these yet, but really enjoy how you have styled them! 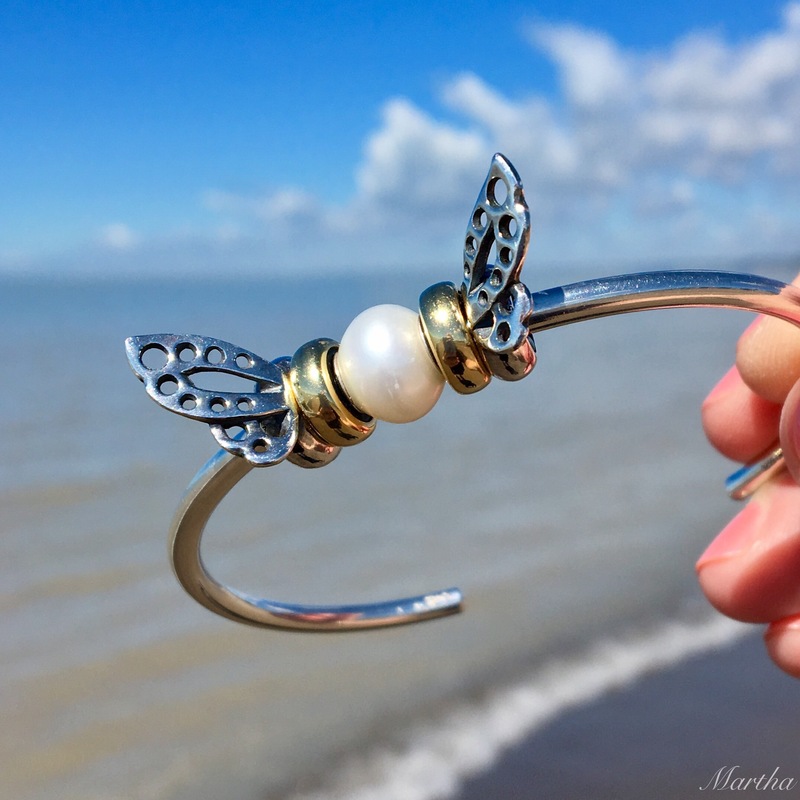 I did order the Carolina Jessamine lock with free bracelet deal so I am really admiring your use of it, too!